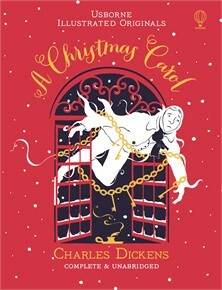 Dickens' story "A Christmas Carol"
Performances inspired by "A Christmas Carol"
A beautifully illustrated, unabridged edition of Charles Dickens' classic. Ebenezer Scrooge is a mean old man who hates everything, even Christmas. But when three spirits visit him, Scrooge goes on a journey to his past, present and future that changes him forever. With a biography of Charles Dickens and internet links to find out more online. Conjure up the spirit of Christmas past with Usborne’s unabridged edition of Charles Dickens’s A Christmas Carol, with beautiful watercolour illustrations.